LAWRENCE — Harry Parker, chair of Texas Christian University’s Department of Theatre, is the inaugural Ronald A. Willis Scholar/Artist as named by the University of Kansas Department of Theatre & Dance. This position, made possible by the Ronald A. Willis Visiting Scholar/Artist Fund, brings master teachers to the university to contribute to the growth of students and the artistry of KU’s theatre production program. Parker has directed more than 100 professional, community and academic productions across the country, and he is the founding managing director of the Trinity Shakespeare Festival at TCU. In Dallas-Fort Worth, his professional directing credits include productions at Jubilee Theatre (including "Company" and "Thurgood"), Lyric Stage ("Into the Woods"), Amphibian Stage Productions ("Hunting and Gathering"), Stage West Theatre ("Vanya and Sonia and Masha and Spike," "An Act of God"), and 17 productions at Circle Theatre (including "Picasso at the Lapin Agile," "The Fantasticks," "My Name is Asher Lev" and the entire "Over the Tavern" trilogy by Tom Dudzick). In Oklahoma City, his professional directing credits include "The Grapes of Wrath" and a concert version of "The Music Man" for City Rep, the latter of which was a unique public works collaboration with a cast of more than 70. He has directed the actors in "Peter Boyer’s Ellis Island: The Dream of America," a piece for orchestra and actors, multiple times with the Fort Worth Symphony Orchestra, as well as the Oklahoma City Philharmonic. At TCU, he has directed "Oklahoma!," "You Can’t Take It With You," "Everyman," "Sweeney Todd: The Demon Barber of Fleet Street" and "No, No, Nanette," among others. He earned his Bachelor of Fine Arts from TCU and both a Master of Arts and a doctorate in theatre & film from KU. This fall, he was on sabbatical from TCU and in residency at KU directing a theatre production of "The Curious Incident of the Dog in the Night-Time." “This recognition is particularly meaningful to me. I never dreamed that would happen. Ron was maybe the most exciting teacher I’ve ever been in the classroom with at KU or anywhere else. To be associated with him, even a little, is very humbling. He was instrumental in my training, and a mentor and a scholar I deeply respected,” he said, adding he was a GTA in Willis' class. Parker is also a professor at Texas Christian University, where he's worked for 16 years. He has directed productions at the Kennedy Center, Stages Repertory Theatre, American Heartland Theatre, Lyric Theatre of Oklahoma and Oklahoma City Rep. A musical theatre historian, he hosts "Curtain Up," a popular weekly radio program about musicals on KTCU, FM 88.7 in Fort Worth. He previously served for 11 years as the director of theatre at Emporia State University. He is a two-time winner of the Kennedy Center Medallion of Excellence and the former national chair of the Kennedy Center American College Theatre Festival. 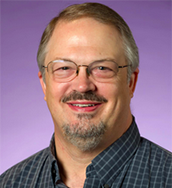 In 2013, he won the TCU Chancellor’s Award for Distinguished Achievement as a Creative Teacher and Scholar. Parker is an associate member of the Stage Directors and Choreographers Society. He is also a member of the KU theatre & dance department’s Professional Advisory Board. The Ronald A. Willis Visiting Scholar/Artist Fund was established in 2015 to honor the contributions of master teacher, director, playwright, adjudicator and author Ronald Willis, who is a former professor and chair of the KU Department of Theatre. Three years later, the fund had matured, and Parker became the first recipient. The fund is managed by KU Endowment, and more growth is possible through contributions of generous donors who are passionate about continuing the legacy started by Willis. Learn more about the fund and Willis at http://theatredance.ku.edu/willis-fund.